Does this e-liquid have a premium taste to match its premium price? If there’s one thing the people at Five Pawns do well, possibly better than anyone else in the game, it’s presenting their product. From the packaging, to the labelling, to their website, everything about this company’s presentation just screams quality and class. 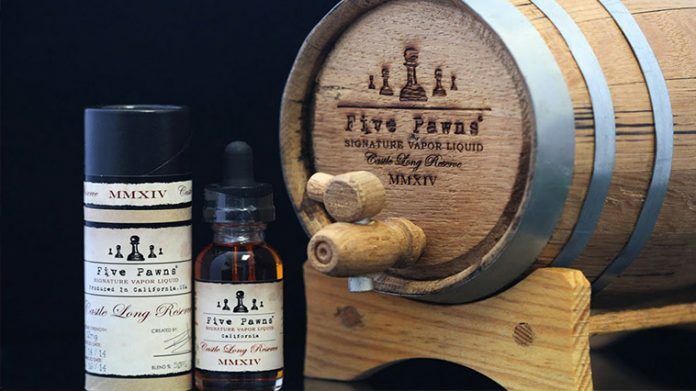 Often lauded as some of the most expensive juices in the industry, Five Pawns e-liquid has been around for years and remains one of the top premium brands on the market. All Five Pawns liquid is made by hand and in very small batches – 500 bottles per lot. Their blends result in a 50% VG / 50% PG combination and come only in 30ml bottles. Flavors use both artificial and natural base ingredients and are available in a variety of nicotine strengths. Black Flag Risen — Flue-cured sweet Virginia tobacco leaf, cappuccino, truffle cream, and mocha dusted black walnut. Bowden’s Mate – Chocolate, crisp mint, ending with a touch of French Vanilla. Castle Long – Kentucky Bourbon, toasted coconut, roasted almond, Madagascar vanilla bean, and caramelized brown sugar. Gambit – Apple pie with flaky crust and decadent caramel, lightened by a dollop of French vanilla ice cream. Grandmaster – Peanut butter and banana cream drizzled with caramel. Queenside – Blood orange and French vanilla. Symmetry Six — Sugared rhubarb, strawberries, oat grain, graham crumble, with vanilla cream. Since their original offerings, Five Pawns has expanded their menu to include even more intriguing flavors. Check them out to see the full selection and learn more about the process behind the creation of their top shelf e-liquids!